1. David Ssejinja founder of this Ssejinja Foundation grew up in Bira, Uganda where many of the Foundation services are carried out. Through his dreams of bettering his home community, David was able to bring himself out of poverty, educate himself and now provides leadership to help hundreds of orphans and widows improve their daily lives. 2. 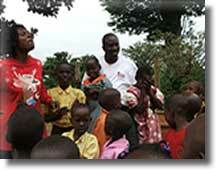 David Ssejinja personally oversees operations in America and in the local communities in Uganda. He and his volunteer corps direct and implement all of the projects in Uganda. 3. Your donation dollars are well spent! There are no paid positions in the Ssejinja Foundation. Less that 1% of every dollar goes to overhead expenses such as postage, printing, marketing. Whatever you choose, know that your contribution -whether it is a financial commitment - or a commitment of your time - is valuable to us, and to the children of Africa. I encourage you to keep exploring our site and become innovative thinkers, practical learners and principled leaders. Thus making an African child smile. Advocacy is the act of supporting a cause to produce a desired change. You can influence parents, teachers or be influential to community leaders through the media. To help the orphaned children of Africa. Sponsorship Program You can make a difference. Most of the younger orphan children needing sponsors are children of Bbira,katosi and Ggenda villages. The women themselves have helped build the school for these orphaned children. However, most families at this school in theses villages live on less than $1 per day. They can barely feed their families so it is a struggle to pay the required funds to keep their orphaned students in school. At your option, you may also correspond via letters with your sponsored child to encourage them in their studies, and help them to become successful students. Your sponsorship payment helps pay the teachers at the school, buy curriculum materials, school supplies and equipment, required uniforms, and provide some supplement food for the child. You can choose annual, term or monthly payment Sponsors are encouraged to exchange letters with t Through Ssejinja Children’s Foundation s Sponsorship Program, students at Bira,Katosi,and Ggenda villages will be supported in their education so that they may use their education to develop their post-war country. This Program will initially serve as the cornerstone program for the organization and will primarily raise funds and sponsors for both the students and teachers of those schools. Through multi-media and informative presentations at local churches and universities, the program seeks to spread awareness of the need for primary and secondary education in Uganda. Sponsor a Child As a child sponsor, you will see up close and personal through corresponding with your sponsored child. How you are helping to create a better, brighter life for the children in need. For $300 a year, your sponsored child receives an education that will help them to become a good citizen of a unified community, in the village of Bira. For $50 a month you can feed and educate and help build a school that will upgrade the classrooms. You will be helping children discover the power of knowledge. Sponsor a Child By sponsoring an orphan child or a project, you can see up close how you are helping to create a better and brighter future for children in need. Corporate Partnerships We work with community leaders who intend to make the Ssejinja Children´s Foundation partnership a long-term investment, one that will expand over time to create greater beneficial outcomes for the companies we partner with and the orphaned children we serve. Donate Your contribution to the Ssejinja Children´s Foundation will support all the work we do to help the orphaned children in need. Such as providing an education, supplying life-saving immunizations for young children, building schools and training teachers. So that even more children have a chance for a better future. 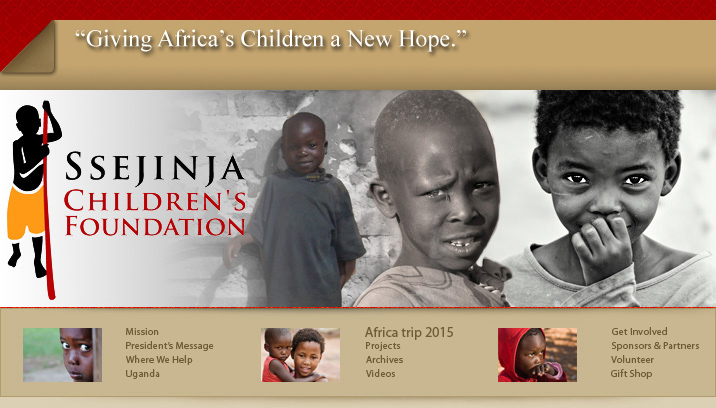 Events Find out about events and benefits that support the Ssejinja Children´s Foundation. Online Gift Shop Check the site and come back often. Planned Giving Planned giving options can easily integrate a charitable gift into a donor´s overall financial, tax and estate planning objectives. Making a gift using one of these plans can maximize benefits to both the donor and Ssejinja Children's Foundation children. Raise Money in your School or Community You can help the orphaned children in need by raising money in your school or community. Not only will children benefit from your fund-raising activities, but they will also benefit because you will have helped to spread the word about the work that we do. Hold a bake sale, a car wash, organize a dance, or a concert, plan a 5K or 10K run/walk. By signing up for our newsletters and other emails. You can keep up-to-date about our work, current emergencies, and have the opportunity to help. Tell a Friend You can make a difference simply by inviting a friend to sign up to receive our monthly newsletter.